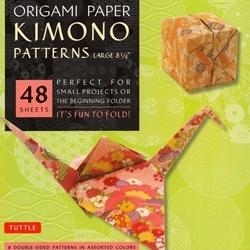 The 48 sheets in this kit feature details inspired by classic Japanese Kimono patterns. On the reverse of each sheet is a solid, complimentary color. Finishing up the kit are instructions providing an introduction to basic origami folding techniques and instructions for 6 different projects.